The Women’s British Open will be held at the Trump Turnberry Resort, which Donald Trump bought in 2014. In the United States, Donald Trump is known as a tycoon, as an outspoken television personality and, now, as a presidential candidate. In Scotland, however, Trump is renowned primarily for his impact on the country’s golf scene although here, too, he is a figure of contention. Trump’s interest in the sport’s homeland will fall under scrutiny this week as the Women’s British Open is held at his most recent purchase, Turnberry or Trump Turnberry as it is now labeled on every resort courtesy car, uniform lapel, item of merchandise and flat surface. The event is a landmark for Trump, 69, who boasts an impressive portfolio of golf courses, mostly in the United States, but who has struggled to gain a foothold in Scottish golf’s links landscape. His plans to build, from scratch, a world-class course and resort in Aberdeenshire have been hampered by legal challenges. And he has prominent opponents, including a former first minister of Scotland, Alex Salmond. But in Turnberry, which he bought in April 2014, Trump owns a four-time host of the men’s British Open. Ultimately, Trump got his way, with ministers voting in 2008 in favor of the course’s construction, deeming the economic benefits to outweigh the environmental cost. His victory was not entirely sweet, though: The Scottish government approved plans for an offshore wind farm just a mile or two from the coast of his Aberdeenshire course. In something of a sulk, Trump has vowed to halt any further development of his resort at Balmedie should the wind farm be built and at present, it appears that it will. 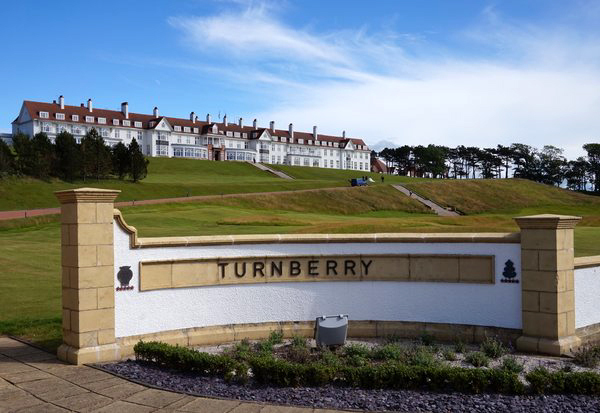 The purchase of Turnberry, already a world-renowned resort, for £35 million (then $59 million) suggests that Trump has effectively given up on his ambition of turning the Aberdeenshire course, which opened in 2012, into a destination of similar standard. Trump has pledged around $250 million in investment toward his Turnberry resort, and with gold fixtures, marble floors and shimmering glass now adorning the recently renovated clubhouse, it is easy to see how $10 million of that money has already been spent. Most locals seem hesitant to comment on Trump’s character, as if torn between wanting to voice their derision and express begrudging gratitude for the investment he has plowed into the region. Professional players have found themselves in a similar predicament. When Rickie Fowler was recently pressed for his opinion on Trump and more specifically Trump’s comments on the “great danger” of Mexican immigration to the United States — he was wary not to cross one of European golf’s biggest investors. Until Trump’s controversial comments, his course at Balmedie was rumored to be under consideration to host the Scottish Open in the future. Such speculation has now abated, given that the tournament is backed by the Scottish Parliament of which Trump is a longtime critic. In addition, in the wake of Trump’s remarks, the P.G.A. of America pulled a tournament, the Grand Slam of Golf, from Trump National Golf Club near Los Angeles the P.G.A. of America called it a mutual decision in a statement and the L.P.G.A. distanced itself from Trump. Trump himself wrote to the British Women’s Open organizers, daring them to find a new venue for the competition if they had such objections. Trump, a man who once invited the Scottish news media to his private hangar at Glasgow Prestwick Airport, holding a news conference in front of his sparkling jet and helicopter knows how to put on a spectacle, and preparations for the Women’s British Open hint at a truly big-time event. Whether the man himself will attend is a matter of local speculation.